Sparring is great for judo experts and even debaters, but it shouldn't apply to your hair. Take down that unruly beast with Headlock Hair Molding Cream, a medium-hold, matte-finish styling agent. It can be worked into both dry and damp hair to create pliability, thickness and texture. Water, Cetearyl Alcohol, Ceteth-20 Phosphate, Tribehenin, PVP, Dicetyl Phosphate, Tridecyl Stearate, Beeswax, Neopentyl Glycol Dicaprylate/Dicaprate, Euphorbia Cerifera (Candelilla) Wax, Caprylic/Capric Triglyceride, Tridecyl Trimellitate, Bis-Diglyceryl Polyacyladipate-2, Hippophae Rhamnoides Oil, Panax Ginseng Root Extract, Swertia Japonica Extract, Panthenol, Lanolin, Methylheptyl Isostearate, Sodium Carbomer, Sodium Benzoate, Phenoxyethanol, Caprylyl Glycol, Fragrance. I tried this product for the first time largely based on reviews I'd read. It really doesn't hold my slightly longer hair. 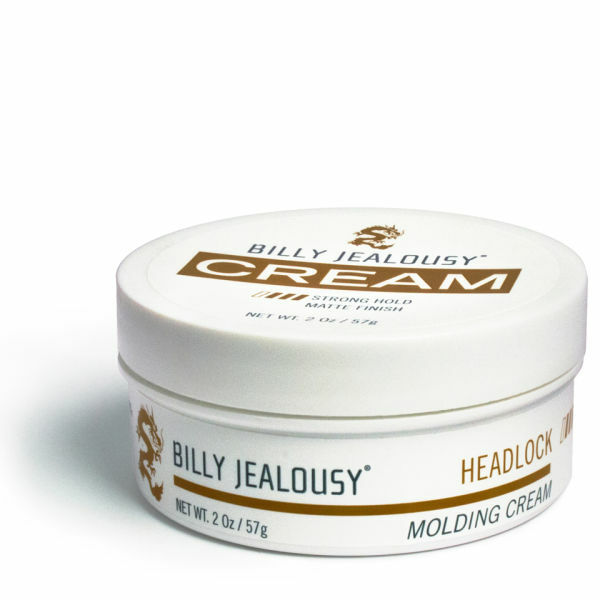 The Billy Jealousy product is not as paste like and whilst it looks very natural it offers very little in terms of long term hold or shaping ability. I've gone back to my old molding cream product and am much happier with the results.